RE: Shields - Read the first post! All Forums >> [Artix Entertainment Games] >> [AdventureQuest] >> [AQ Encyclopedia] >> Info. Submission >> RE: Shields - Read the first post! The shards of this mirror work well for resisting Light damage and deflecting Magic attacks. Few things are as unlucky as breaking a mirror, so when a foe strikes this shield, some of that misfortune can lash out at them! *Your foe shatters a mirror shard, and is cursed with bad luck! Not sure if there's a pop-up for when the status fails to inflict. Forged from a guitar played by a legendary musician, this shield resists Light and helps deflect Ranged attacks. While holding it you're filled with courage and won't back down, taking less damage as your health decreases! Pretty much a shameless clone of Figurehead, just with Light resist and shuffled blocking. Light shield, MC effect is taking -X/1.4% damage from monster attacks. X = 10 - (CurrentPlayerHP/MaxPlayerHP*10). So as you lose HP, you take less damage from incoming attacks, up to -10/1.4% damage. I have a lvl 11 alt and it looks like the level 5 Broken Mirror Defender is actually Guardian only somehow. Is the Broken Mirror Defender rare? Energy Shield. Works similarly to the Light/Under Realm shields, but tweaked the same way the Energy Realm Blade is. First turn either of them are equipped, the shield makes you take -(5/1.4)% damage. After that, you will instead take -(5/1.4/0.85*0.5)% (AKA -11.9%) damage if and only if the enemy never attempted to attack you the previous turn. As with the weapon, this can activate via Paralyse, Freeze, Daze, etc. As long as no attacks were attempted on you the previous turn, you'll take -11.9% damage. This bracer is so brilliant that it can blind your opponent... provided you can catch it off guard with a miss. *The shield reflects light in your foe's eyes, blinding them! **The shield reflects light in your foe's face, but they quickly shield their eyes. Light shield favoring Magic blocking. MC: Whenever the enemy misses with its last attack, apply a -(28.57*[hits missed]/[hits attemtped]) BtH Blind penalty on its next turn. What are the save rolls for Chaser's blind infliction? 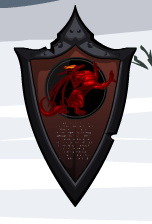 A shield specially forged by the Animal King to thank you for your contributions! 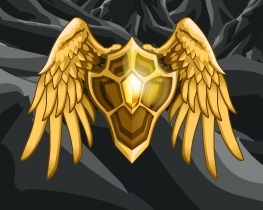 This shield will drain your foes of their time energy when you block, paralysing them! Your foe hits the shield, which drains thier temporal mana and paralyses them! Your foe hits the shield, but endures its temporal magic! This shield is perfectly designed to hold back masses of impatient scamps who want to get past you and open at their presents early! Every time you're struck the shield will generate a little SP! Heal the listed SP when you block (rounded randomly). MC Ice shield. Currently available for 0 gold. MC: When you block an attack, there's a [hits blocked]/[hits connected] * 10/21 chance of Paralysing the monster for 1 turn. The monster can resist with a save at a +0 bonus (inflict with DEX/LUK; resist with END/LUK). If the enemies always auto-hit when you're using the samukematsuri armour does that mean that the samukematsuri shield will never heal sp when used along with the armour? IMRy probably just flubbed when transcribing the info, the Samukematsuri Shield actually heals SP when you get hit, not when you block. Also, the armor only makes you get hit all the time when the FSB is active. Hits blocked/hits connected : What happens if you block all hits? Like 1 hit blocked 0 connected? 1/0 how does that work? I'm almost sure it's hits attempted, so the chance is 1/1 (100%). Ice and Fire shields, focus on Melee/Ranged defences. MC effect is the ability to click to pay 15% Melee in SP each turn and take -(15/1.4)% damage from all attacks. Is priced as misc + shield compression, similar to Cozy Farzhad Mogloo. EDIT: Corrects stats up now. This wicked cold shield delivers impeccable Ice protection, which you can enhance with an investment of fighting spirit. *Click to activate a defensive barrier, lowering damage you take! Costs <> SP. 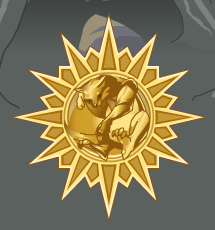 This shield draws power from the Neko spirit, Sol! It resists Earth damage, helps defend against Ranged attacks, and also will reduce incoming damage based on your CHA stat! This shield draws power from the Neko spirit, Sol! It resists Light damage, helps defend against Ranged attacks, and also will reduce incoming damage based on your CHA stat! This shield draws power from the Neko spirit. Luna! It resists Water damage, helps defend against Ranged attacks, and also will reduce incoming damage if you wield a bow, wand, or similar weapon! This shield draws power from the Neko spirit. Luna! It resists Darkness damage, helps defend against Ranged attacks, and also will reduce incoming damage if you wield a bow, wand, or similar weapon! Doray is missing from the elemental shields index. Ice shield. MC effect is similar to Chaser Bracer and Broken Mirror shield, based on the % of hits you block, you'll attempt to apply Choked to the foe. 5% MC at a 15% proc rate means it's worth 33.33...% Melee, 50% save cranks that up to 2/3 Melee, then *10/9 since it has no effect on the first turn it's equipped, so 74.1% Melee. Once the monster finishes its attacks, if you blocked any of them you'll inflict a 3 turn -(41.5*Blocks/Attempts)% damage Choke on the mob. The Choke is 50% stronger if you have the axe equipped at the same time. Inflict with VStat/LUK, resist with END/LUK, 50% save. Earth shield. Slight Melee focus. MC effect is that based on % of attacks you block, you will then do a hit of damage at the end of the monster turn worth (5/0.15*0.85*0.5*Blocks/Attacks)% (~14.166...% if you block everything) Melee, You then get hit for healing equal to the damage the previous hit dealt. Inspired by the Alucard Shield effect with the Shield Rod from Symphony of the Night. Are we going to get info subs for the Sol and Luna Defender Shields? Dragon Shield trigger: "It's -(5/1.4)%, -(7.5/1.4)%, or -(15/1.4)% damage if fighting non-Fire Drakel/Dragonkin, Fire Drakel/Dragonkin or non-Fire Dragons, or Fire Dragons." 4 separate shields, Earth and Light for Sol, Water and Dark for Luna. Luna's MC is that if you are currently wielding a weapon with 100% special rate (eg a bow/wand/etc) you take -(7.5/1.4)% damage from enemy attacks. Sol works similarly to Lepre-chan, in that it checks player CHA vs expected CHA, however the boost is that you take -(Min(PlayerCHA/ExpectedCHA*7.5,8)/1.4)% damage. In short, if your CHA is = to the expected CHA, you take -(7.5/1.4)% damage, if your CHA is a bit higher, you do get a BIT more, but only up to -(8/1.4)% damage.